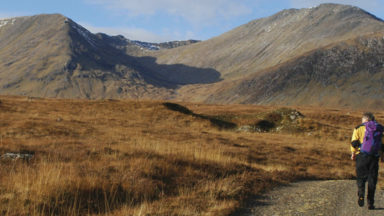 spring, early summer and early autumn are the best times as the weather is mildest and the midges are in abeyance; high summer is the busiest season and midges can be a nightmare on Rum; winter days are short and storms are frequent, but the solitary grandeur of the islands in winter weather is ample reward for the well-prepared walker. 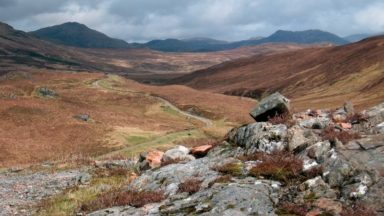 routes range from the challenging to the relatively undemanding; weather can change suddenly in the Hebrides - be prepared for wet, wild and windy conditions. The Small Isles, and the nearby Hebridean twins Coll and Tiree, offer adventurous walkers a fine range of routes, from the jagged volcanic peaks of the Cuillin on Rum to the beaches, dunes and machair pastures of its lower-lying neighbours. Many of the walks follow sublime coastlines, dotted with striking geological formations and teeming with wildlife. 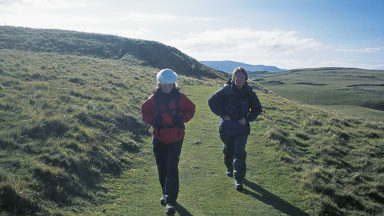 Easier routes on Rum, along long-established paths, explore the National Nature Reserve with opportunities to spot deer, golden eagles, feral goats and Rum ponies along the way, and detailed information is included on each island's history, geology, wildlife, plants and flowers to help walkers make the most of their experience. Rum is by far the largest of the Small Isles, and arguably the most mountainous island of its size in Britain. Rum's highest peaks, Askival and Ainshval are Corbetts, and it's also the smallest Scottish island to have a summit over 762m. A round of the Rum Cuillin is included in the guidebook, but walkers will also find there's much more to discover. Eigg, second largergest of the Small Isles, lies a little less than 7km south-east of Rum, and boasts the most varied scenery and range of wildlife habitats. Canna is the westernmost and the second smallest of the Small Isles. It's linked to its tide separated sister, Sanday by a bridge and by sandbanks and a road a low tide. Muck is the smallest and most fertile of the Small Isles. Muck is also known for its seal population, and for the porpoises in the surrounding waters. Coll and its near neighbour, Tiree are often referred to as the Hebridean Twins. 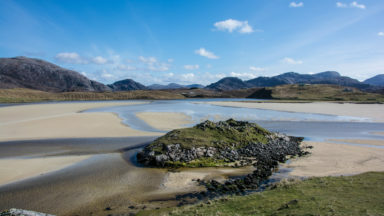 This guide describes 16 routes across Rum, Eigg, Muck, Canna, Coll and Tiree, suitable for a wide range of abilities, and exploring coast, mountains and wilderness. 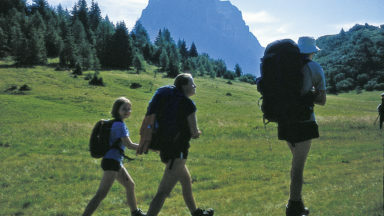 It is essential that you have the appropriate maps for the walks described in this guidebook. There are few waymarks, signposts or paths of any kind, making accurate route finding all the more important. A degree of navigational proficiency is indispensable. A compass is indispensable and a ‘wristwatch’ altimeter is also very useful for navigation, especially on the hills of Rum. It’s not quite so easy to get lost when walking along the island coastlines, but it is important that you know exactly where you are, especially in poor weather/visibility and if for any reason you need to head inland from the coast. p68 and p88 The footbridge across the Kilmory River was washed away in 2017 and as yet the Isle of Rum National Nature Reserve have not responded to enquiries as to if and when a replacement will be installed. Depending on the tide it is possible to cross the outflow of the river where it crosses the beach. Unless the river is running high it is also possible to cross using a sill in the bank though great care should be exercised. 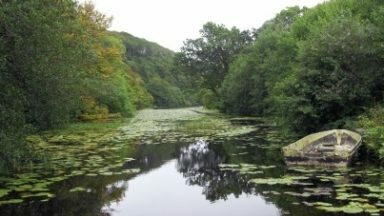 Walk a short distance north of Kinloch Castle to the junction by the bridge that leads to the community hall. Turn left here and continue for 150 metres before turning left at a metal gate. Follow the track past the old castle garden walls to the generator and continue along the Allt Slugan to the edge of the woodland before emerging onto rising open ground. p43 'at around 650m, follow the path off the ridge as it skirts around Askival’s east flank' Reader, Michael Smith reports that 'the path we found was higher (as measured by GPS rather than contour on the map) at 694m. Before the substantial old cairn is reached indicating the right turn to go up to the ridge, there are several tempting but inferior ways up'. The Rum Bunkhouse, managed by the Isle of Rum Community Trust, is now open (autumn 2014) and has accommodation for up to 20 people in four mixed dorms and one twin room. There are two fully equipped kitchens and a lounge with a wood burning stove and sofas. 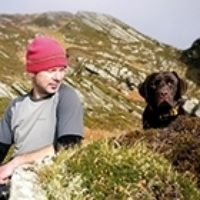 Since moving to Scotland from the south of England in 2006, Peter has developed a passion for the Hebrides. He lives at Rhenigidale on the Isle of Harris with his wife, Fiona and their Labradors, Dougal and Mara.